Titanic: Voyage To The Past On April 10, 1912, the British luxury liner glided through the Southampton, England, harbor to begin her ill-fated maiden voyage. Five days later, the $7.5 million vessel sank after striking an iceberg in the north Atlantic. 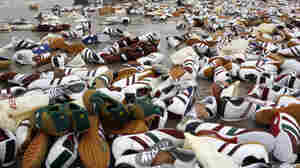 The tragic disaster claimed 1,517 lives. There were 711 survivors. 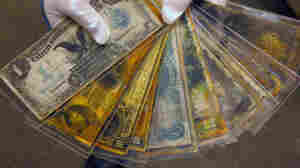 The $7.5 million vessel sank after striking an iceberg in the north Atlantic, claiming 1,517 lives. 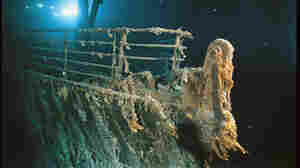 April 15, 2012  One hundred years ago, the Titanic struck an iceberg and sank into the Atlantic on its maiden voyage. At that very spot today is another luxury liner, there to mark the centennial of the disaster. Writer Lester Reingold is on board the memorial cruise, and he sends us this report. April 14, 2012  When explorer Robert Ballard discovered the Titanic on the sea floor in 1985, he also found a pair of leather shoes sitting on the deck near the stern of the ship. 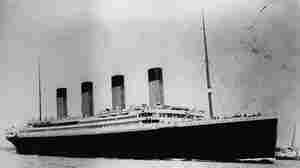 April 14, 2012  John Edward Simpson was a ship's doctor aboard the Titanic. He wrote a letter to his mother back home in Belfast, a few bits of news and fond wishes. The letter, sent from the great ship's last port of call, made it home. Simpson did not. April 13, 2012  Titanic the musical, that is. 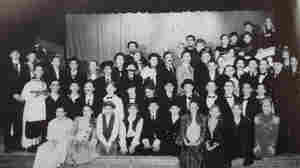 NPR.org's Dana Farrington played a drowning victim as an eight-grader in 2002. The costumes and set were memorable in a good way, she says. But portraying the tragic ordeal was a bit creepy. 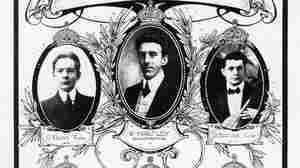 April 13, 2012  Wallace Hartley left work as a bank teller to become a conductor. He spent his final moments on the deck of the Titanic, leading the ship's seven musicians in song as they sank into the North Atlantic. April 12, 2012  People behaved very differently on another ship that sunk around the same time. An economist thinks he knows why. 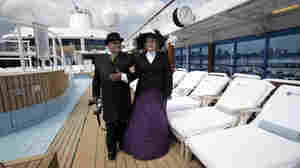 April 10, 2012  On April 10, 1912, the Titanic set sail for New York City. The rest of the story has been the subject of countless books, shows and films about the legend of the "unsinkable" ship. Bob Ballard, who discovered the wreckage, talks about why the story is still so fascinating. 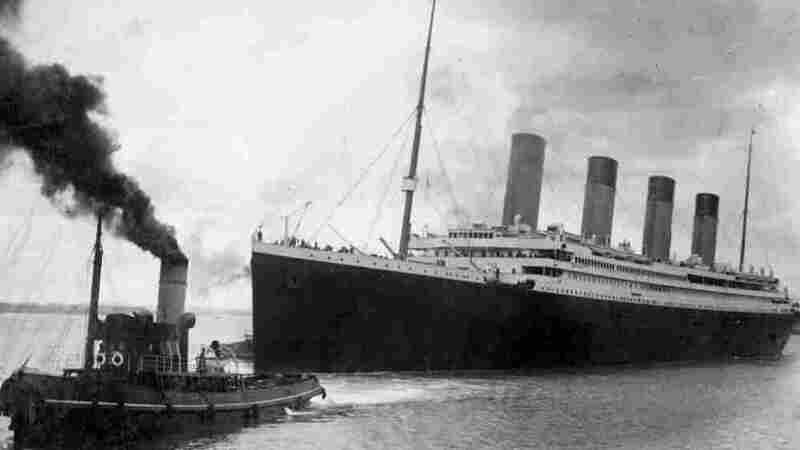 April 9, 2012  I'm working on a radio story about the sinking of the Titanic, and I need to grab a few audio clips from the movie. That's harder than I thought. April 6, 2012  It's been 100 years since the sinking of the RMS Titanic, and the anniversary brings with it a barrage of literature. Former NPR editor Rachel Syme has been keeping track of the new releases and lists her favorites here. Do you have a favorite Titanic book? Let us know in the comments. April 4, 2012  The world seems obsessed with the Titanic, which went under nearly 100 years ago. At a museum in Britain, you can study Titanic products. Items include: Iceberg Beer, a Titanic Barbie doll which looks like Kate Winslet's character from the movie and a Tubtanic bathtub plug. March 30, 2012  Filmmaker James Cameron has just returned from a successful submersible expedition to the deepest spot in the ocean — and he's also gearing up for the 3-D rerelease of his 1997 epic, Titanic. Cameron says that for him, filmmaking and exploring are two aspects of the same basic impulse. 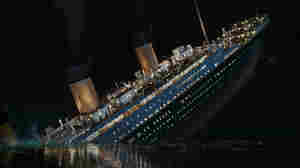 March 28, 2012  Next month marks the centennial of the sinking of the Titanic. A collection of more than 5,500 objects amassed during seven expeditions to the site is up for sale. Items range from binoculars and tea cups to a giant slab of the ship's hull. The collection has been appraised at $189 million. David Greene talks to Arlen Ettinger, president of Guernsey's, the auction house managing the sale. January 11, 2012  A ship will leave Southampton on April 8 and stop at the site of the Titanic's sinking on the 100th anniversary of that tragedy. Then, it is to finish the voyage that the Titanic couldn't. 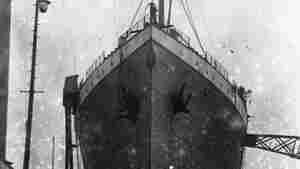 December 29, 2011  The company that salvaged thousands of artifacts from the Titanic will auction them together next April, on the 100th anniversary of the ship's sinking. 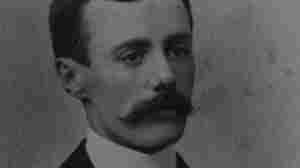 White Star Line heir J. Bruce Ismay was one of 325 men to survive the sinking of the Titanic. 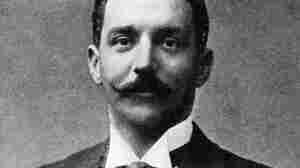 October 15, 2011  In 1912, J. Bruce Ismay was one of the most hated men in America: He owned the Titanic; gave the ship just 20 lifeboats; and — unlike so many — lived through its maiden voyage. 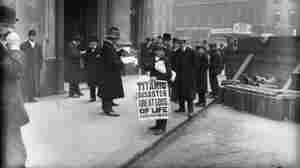 Frances Wilson tracks the scandal of Ismay's survival in How to Survive the Titanic. August 7, 2011  NPR's summer road trip series continues with a tribute to two influential Washington, D.C., figures from the early 1900s. A 12-foot fountain in the nation's capital honors the friends, who took an ill-fated trip in 1912 aboard a brand-new ocean liner called the Titantic. Emily Friedman reports. June 9, 2011  Mark Wilkinson of Birmingham, England, may have invited a bit of bad luck when he named his used 16-foot cabin cruiser Titanic 2. When the boat returned to harbor from its maiden voyage, it sank. The harbormaster took Titanic 2 in tow, and pulled Wilkinson out of the water. March 31, 2008  Bryars' first major composition, The Sinking of the Titanic, still sounds as vital, fresh and forward-thinking as it did when it was written in 1969. The piece was performed in 2008 as part of the Wordless Music Series recorded by WNYC in New York City.